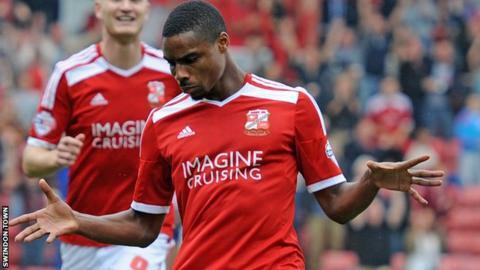 Swindon Town striker Jon Obika says he is relishing playing regular first-team football for the first time. The 24-year-old came through Tottenham's academy and had 11 separate loan spells from Spurs in six years. But he joined Swindon on a permanent deal on 1 September and has scored in four successive games so far - matching an 88-year club record. "I feel amazing," said Obika, after scoring in Tuesday's Football League Trophy win over Newport. He told BBC Wiltshire: "I haven't had a full season in the league. It's been half-seasons or for a few months. I'm now looking forward to more." Jon Obika has matched the achievements of Harry Morris by scoring in the first four games of his permanent spell at Swindon. Morris, the club's all-time record goalscorer, signed for Town in 1926 and netted hat-tricks in his first two games, one goal in the next, and two in the following match. Obika's first experience at Swindon came during a two-month loan spell in 2011, when he failed to score in five games. But the London-born forward said he worked hard to improve his game prior to returning to the County Ground. "I did a lot of stuff, mentally. I watched a lot of clips of myself and of other strikers - like Didier Drogba, Thierry Henry and Christian Benteke - to get information from their play and it's definitely helped. "I've always believed in my ability in front of goal but it's a testament to the other players feeding me and giving me the opportunities to score." Obika will be competing for a place up-front alongside Michael Smith and Andy Williams - who have scored six and five goals respectively this season - as well as George Barker and Connor Waldon. And manager Mark Cooper said of Obika's five-goal start at the club: "He could have had a lot more goals, but we'll take that for starters. I think Jon will get better and better the more he becomes accustomed to our way of playing. "The competition keeps everyone on their toes and it makes sure they are bang at it for every game."